Åhu is a sweet and warm soup of sorts, and is a very popular dessert drink on Guam. It’s one of the first things I make when I go home for visits. While you can make this dish using frozen månha (the meat from young coconuts) and the juice from the månha, there is nothing like using the real thing. This delicious and sweet drink is thickened by the månha dumplings, made by mixing pureed månha, sugar and tapioca starch. The dumplings — I call them lumps — cook in boiling hot månha juice until they float to the surface indicating they are done. 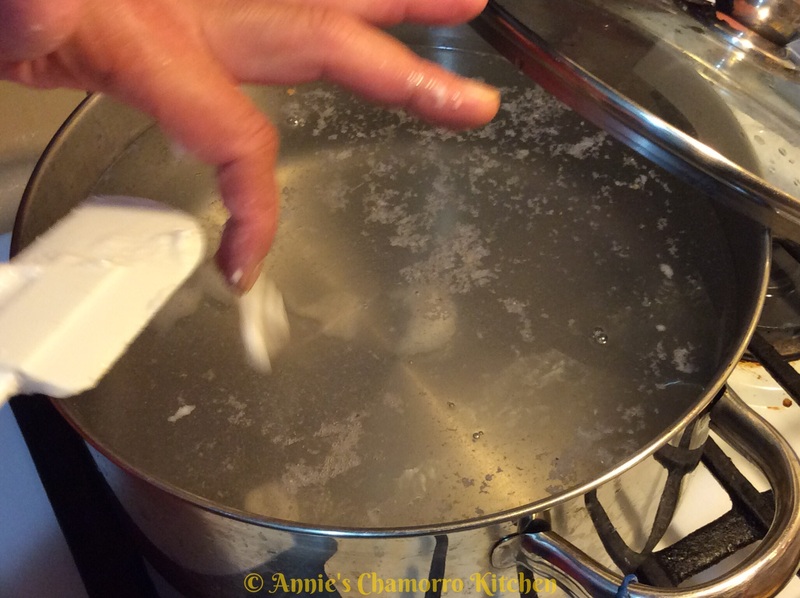 It doesn’t take long to cook up a huge pot of åhu. What DOES take long, however, is cutting down a bunch of månha, cutting them open and collecting the juice, then scraping the meat. I’ll bet many of you didn’t know there are some species of coconut that are orange when young, not just the common green ones. After draining out the juice, cut open the månha and scrape out the meat. Be careful not to scrape out any of the husk if you can help it. The månha meat is very tender; it doesn’t take much effort to scrape it out of the shell. After you’ve collected the juice and meat, it’s time to get cooking. Place the månha juice into a large pot. You don’t need much juice to get great tasting åhu. You can use all juice or a mixture of juice and water. My dad likes to drink the månha juice so when my sister and I made this, we diluted it by mixing 8 cups of månha juice with 8 cups of water, saving the rest of the juice for dad. If the juice is sweet, you don’t need much sugar. We added about 3 cups of sugar to all that liquid. Add a cup at a time and taste as you go, adding as much sugar as you like. Bring the liquid to a slow boil while you make the månha dumpling mixture. 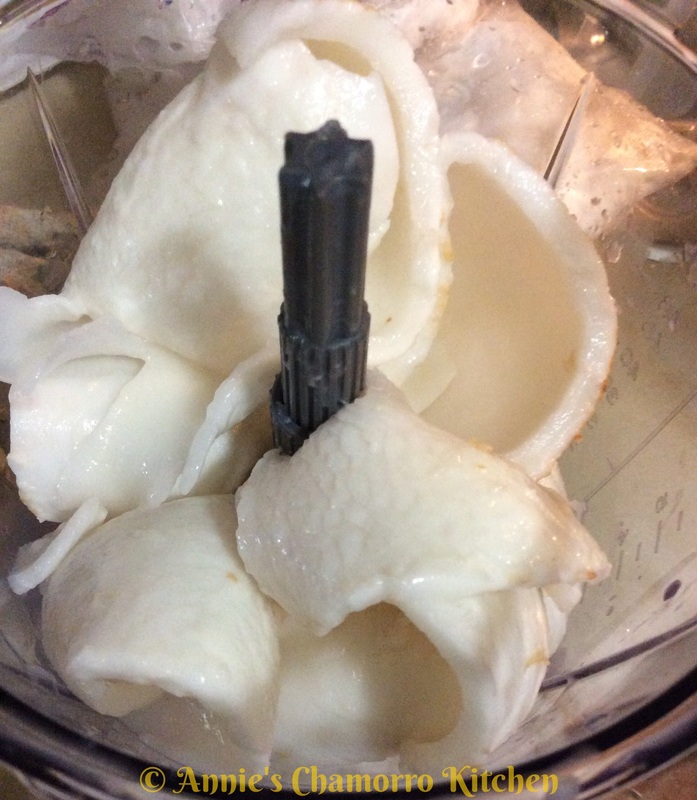 Place the månha in a food processor. Use more månha if you like lots of “lumps” — we used 4 cups of månha (my family likes lots of lumps) for a large pot of åhu. Process the månha until it’s smooth and creamy. 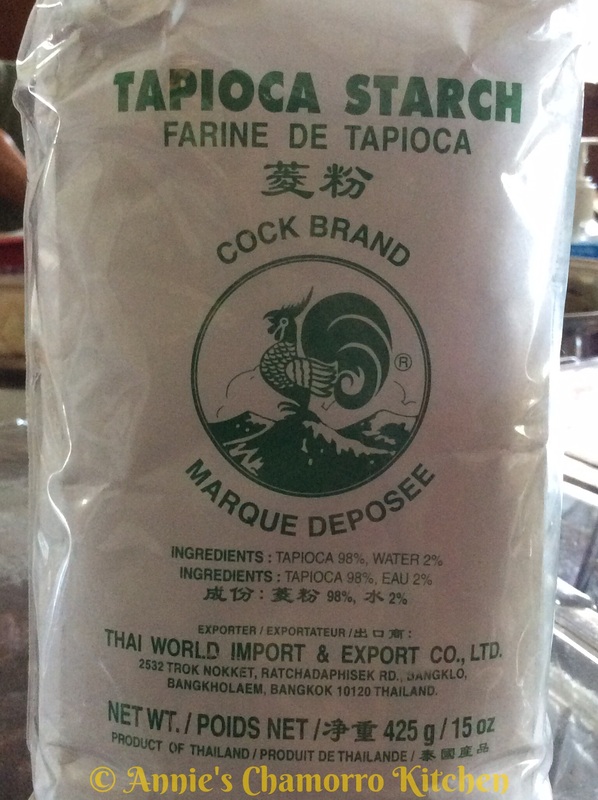 Add the entire bag of tapioca starch to the pureed månha. 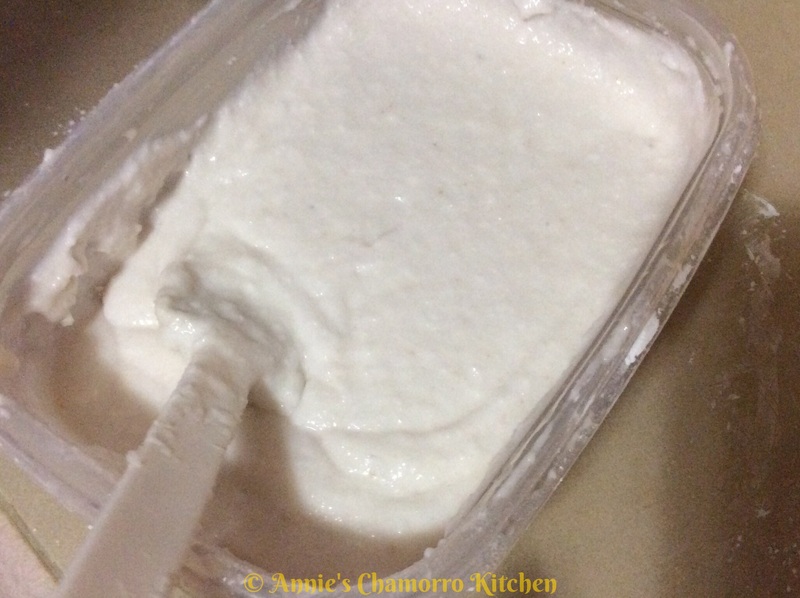 Save the rest of the tapioca starch in case you need to thicken the åhu liquid later or to add more to the månha-starch mixture (more on this later). Add sugar to the månha-starch mixture. You don’t need much since you’ve already sweetened the liquid. The amount of sugar also depends on how sweet the månha meat is. This batch of månha was very sweet so we added just one cup of sugar. The mixture will be very thick, thicker than cake batter. Drop small dollops of the batter into the boiling liquid. Do a test batch first to taste if it’s sweet enough. Add more sugar if you want it sweeter. 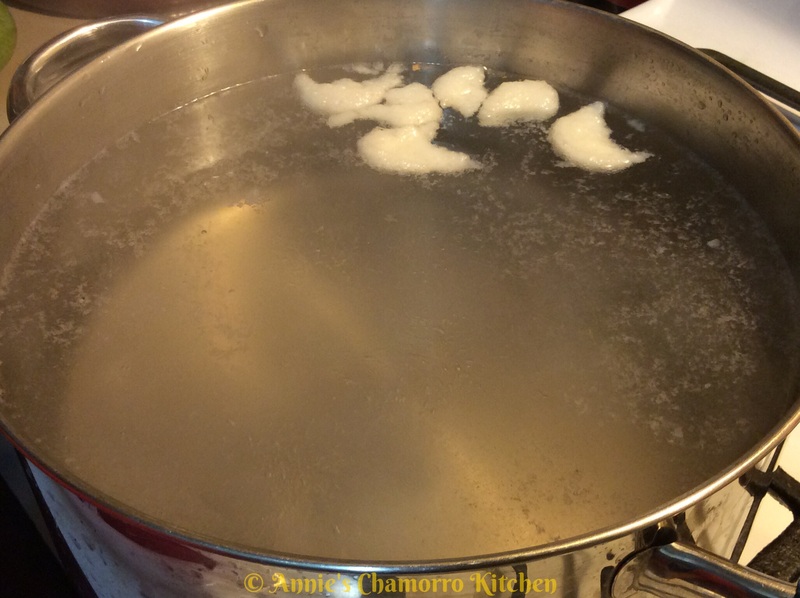 The lumps will float to the top of the pot when done. If the lumps break apart during the cooking, that means you need to add more starch. Add a few spoonfuls at a time, then cook a test batch to make sure they stay intact. This recipe makes a LOT of lumps — just the way my brother likes it. The starch in the lumps also serves to thicken the åhu. Let the mixture cook over low heat for a few minutes after all of the lumps are done. 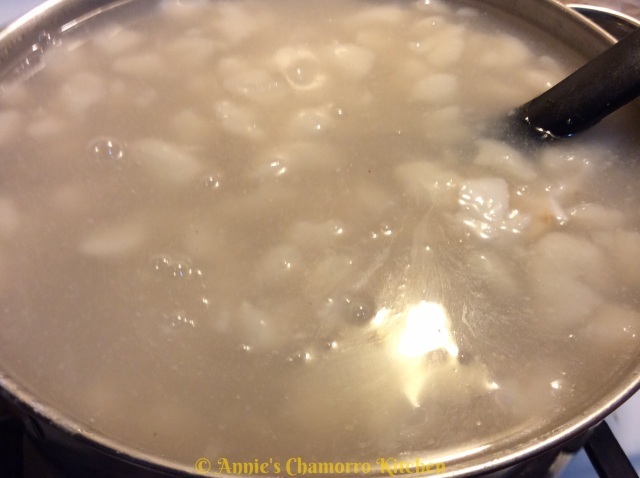 If, after a few minutes, the liquid is not thickening, mix any reserved tapioca starch with a cup of water; stir the mixture into the åhu and cook for a few more minutes until thickened. 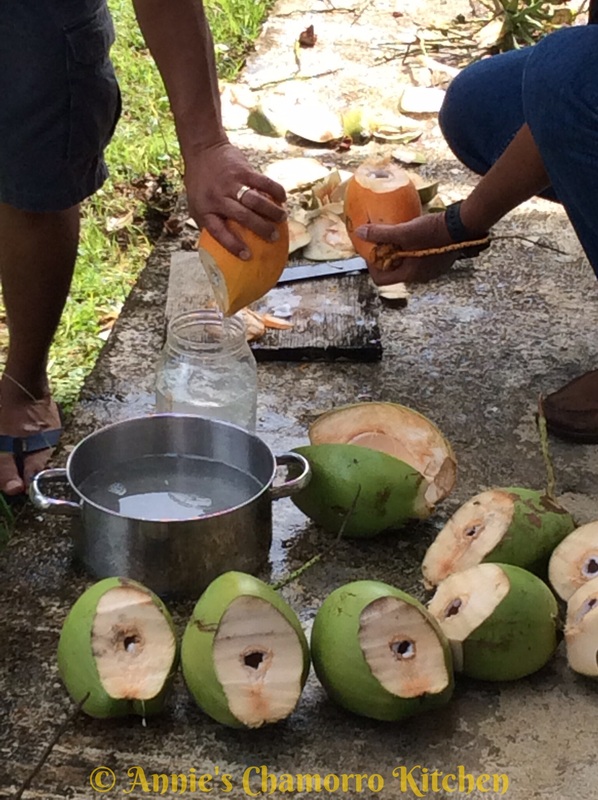 A warm, sweet dessert drink made from the juice and meat of young green coconuts. Place the månha, juice, and sugar in a large pot. 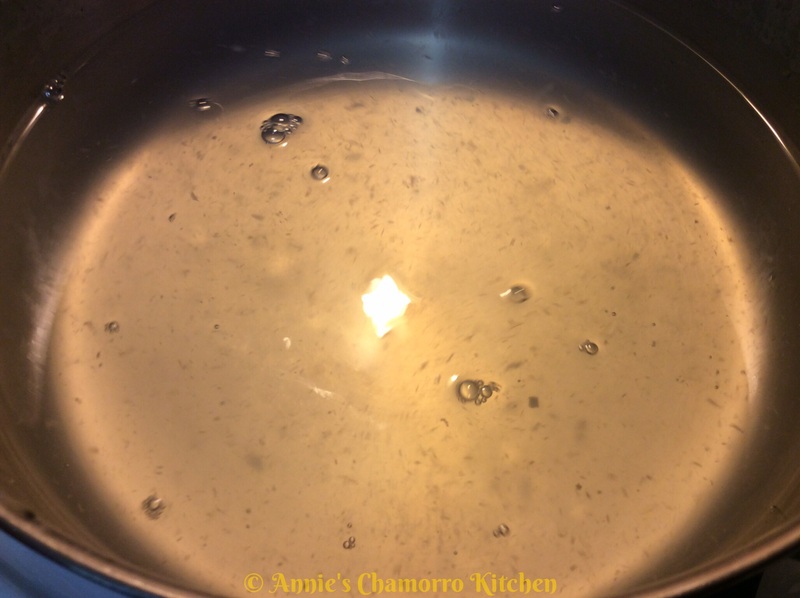 Bring to a boil over low heat. Mix together the pureed månha, one bag of starch (reserve the remaining half bag), and sugar to form the batter for the dumplings. Drop the batter into the boiling liquid by the teaspoonful. The dumplings will float to the top when done. 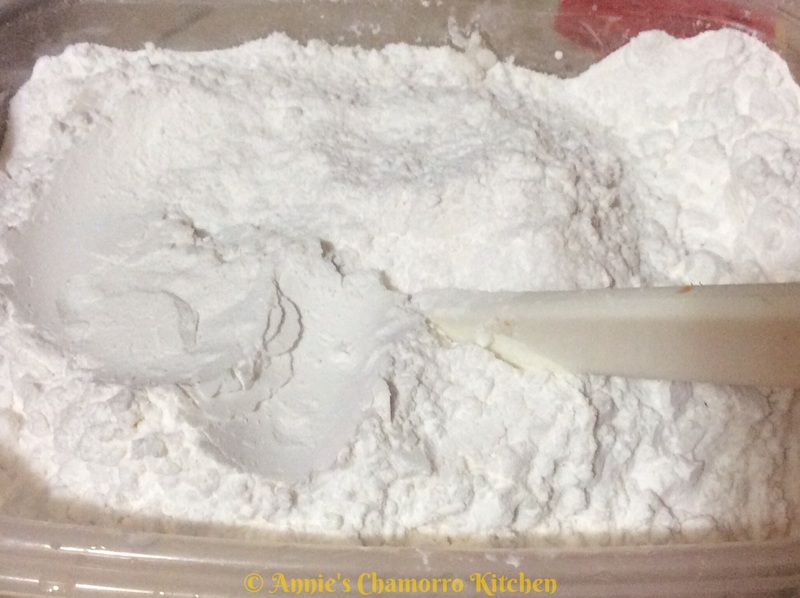 If the dumplings break apart during cooking, add a couple of tablespoons more starch to the dumpling mixture. "Test cook" a few dumplings to ensure they don't break apart and is sweet enough. 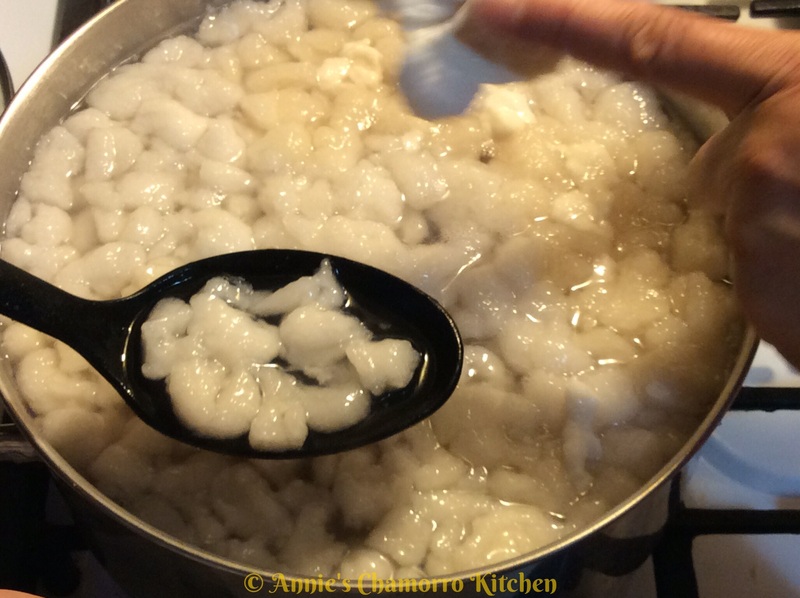 If the dumplings still break apart during cooking, add a couple more tablespoons of starch. After all of the dumplings are done, check to see if the åhu is thick enough for your liking. It should be the consistency of not-too-thick gravy. If you'd like it thicker, mix any remaining starch with 1 cup water; stir the mixture into the hot åhu. Cook for a few more minutes until the åhu thickens. how many servings does the Ahu make? It depends on how big a cup/mug/dish you’re using…at LEAST enough for 10 people. Hafa adai you really have a wonderful array of great foods from our island . Is it possible to serve this cold or room temperature? I was just curious because I wanted to make some for a party. What is the best method of keeping it warm if it’s not going to be served for a couple of hours? You can serve this cold. If you want to keep it warm, I’d just reheat it right before serving. Annie, Asian stores sell young, fresh coconuts. I buy them often and make ahu and manha pie with them. It’s no different than what we would make at Mom’s. 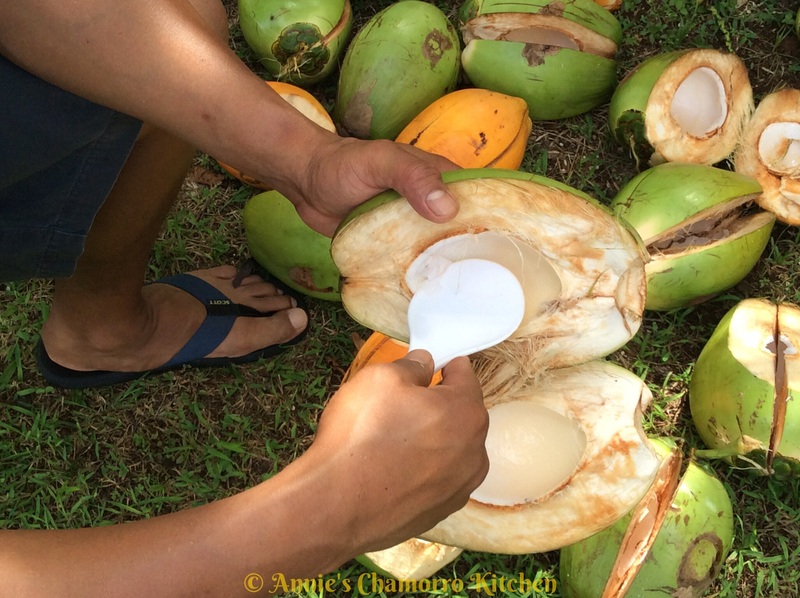 I chop them open myself and use the coconut juice and manha to make the ahu and pies. Canned and frozen does not compare to fresh, young coconuts, but if you can’t find fresh, young coconuts, use what you find. Sometimes, it just doesn’t taste as good though. Sometimes the Asian store here sells månha. I’ll pick some up the next time I see them. I just hope they aren’t spoiled; I’ve bought coconuts before that were so old the meat inside separated from the shell. I wanted to ask since I’m here in the mainland can i use coconut juice in the can? Yes, you can. Make sure you buy the 100% young coconut juice that is only naturally sweetened (with no added sugar or artificial flavorings). 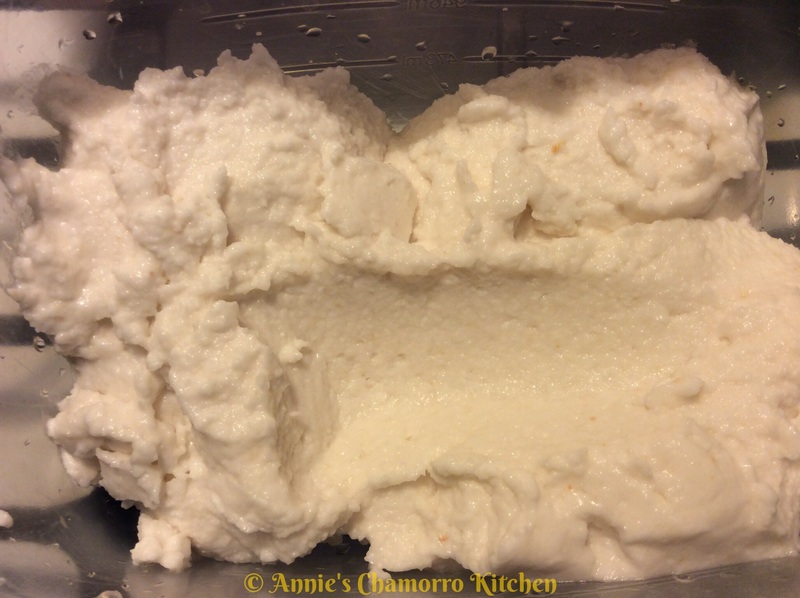 I can’t seem to find tapioca starch any way to substitute it? No, you need tapioca starch for this. Most grocery stores sell it nowadays. Look where the almond flour is kept. Also look for tapioca flour (it’s the same as tapioca starch). Where can we get these ingrieduent a like the manha juice here in the states? Is there a good substitute to use? Thanks! Pam, you can use frozen or canned young coconut. Most Asian stores sell it. This is to die for…yummy! Hey Mike, you can buy frozen manha…they aren’t too expensive. Most Asian stores carry it. Perfect ….. I am excited about this!!!!!! Thank you very much!!!!! Oh how I really miss eating ahu! I love this. Really homegrown taste of Guam! OMG. I been wanting this forever n ever. Yummmmyyyyy.